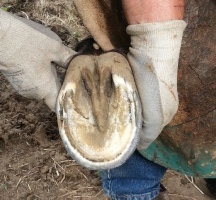 This is an example of typical hoof growth after two previous applications of Hoof Armor. Any type of trim can be done including natural rollovers, mustang roll, etc. The preferred trim; the Hoof Armor Corrective Trim, is available here. Paring the sole is not recommended. 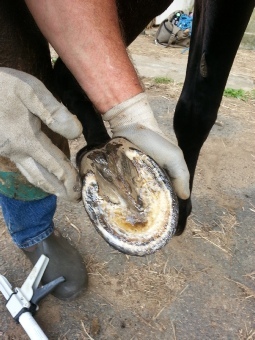 The hoof should be freshly rasped, stiff bristle brushed or wire brushed. Apply a THIN bead of Hoof Armor to the hoof wall. 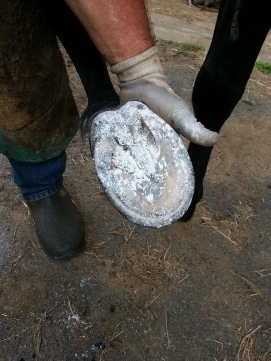 Hoof Armor can be applied to the sole for immediate protection and to grow thicker sole for future stone protection. 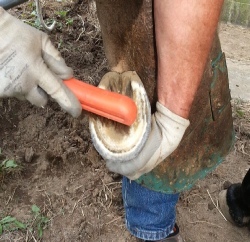 Two rubber gloves are included in the kit to spread the Hoof Armor to the desired thickness. Only a THIN coating is required. Once applied the hoof should be coated with Talcum or Baby Powder if the hoof is to be set down on concrete or rubber mats. Otherwise it can simply be placed down in sand or loose soil. The reason the powder is used is to keep Hoof Armor from smearing on concrete or rubber mats. Wearing a pair of latex gloves and using a gloved finger to rub the Hoof Armor into the sole gives the right thickness and cures quickly. 1) Hoof Armor goes on very thinly.Like a varnish coat. Thicker is not better. 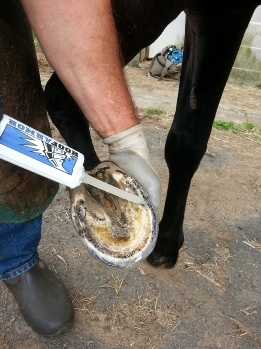 2) If Hoof Armor is applied too thickly it will not cure properly and will peel off. 3) Hoof Armor is very liquid when it is dispensed from the tube. It comes out quickly. 4) You do not need to pull the trigger on the dispenser very hard for Hoof Armor to be dispensed. 5) Once Hoof Armor is applied, talcum or baby powder should be applied liberally so that it coats all the areas that Hoof Armor has been applied to. We recommend a horse should be in the pasture or stall for a couple of hours to let Hoof Armor cure. 6) Hoof Armor goes on looking very shiny. That will change once the horse begins to travel. Hoof Armor will take on a matte appearance. Please do not think it is not there! If you do not see hoof wear, then Hoof Armor is doing its job in protecting the hoof. Sometimes wetting the hoof will allow you to still see shiny spots. 7) If a second coat is desired it can be applied 24 hours after the first. 8) Hoof Armor can be applied to the sole, frog (which is on the same plane as the sole), heel bulbs and up onto the front of the hoof to about where nail holes would be on a shod horse. 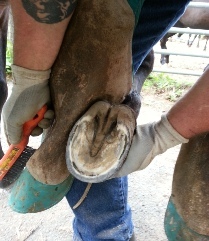 9) How dry should my horse’s hooves be before applying Hoof Armor? If necessary, and the weather has been all rain, please keep the horse in a stall or enclosed area where it can stand in shavings or dry sand or dirt for 1-2 hours. Overnight, or for several hours, is optimal. 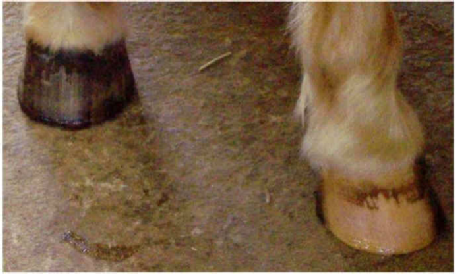 Optionally, one can use a hair dryer or heat gun to dry the hooves beforehand. 10) Leave the last mix nozzle on the cartridge. Do not re-use the original cap. 11) If necessary, Hoof Armor can be reapplied during a long ride just by wire brushing and cleaning the hoof, then reapplying. 12) Hoof Armor summer/winter application tip. Keep Hoof Armor cool in the summer and warm in the winter. Around 76°F (24.5°C) is optimal. 13) In weather below freezing (32° F or 0°C) warm the hoof surface where Hoof Armor is to be applied using a hair dryer or heat gun until warm to the touch and warm the cartridge using the same method. 14) Hoof Armor is exothermic and actually bonds to the outermost layer of the hoof. It is not just a coating where building it up would be of benefit. 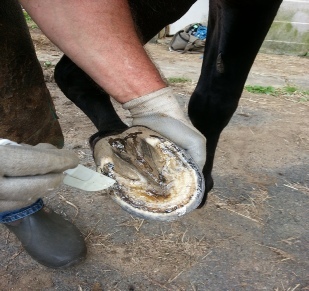 Because Hoof Armor behaves like the Periople on the front of the hoof, and, protects the sole of the hoof from the wet/dry cycle, the hoof is allowed to be strengthened from the inside. And Hoof Armor, unless significant abrasive riding is done, remains with the hoof until the next trim. 15) Hoof Armor is successfully used on barefoot, booted and shod horses.